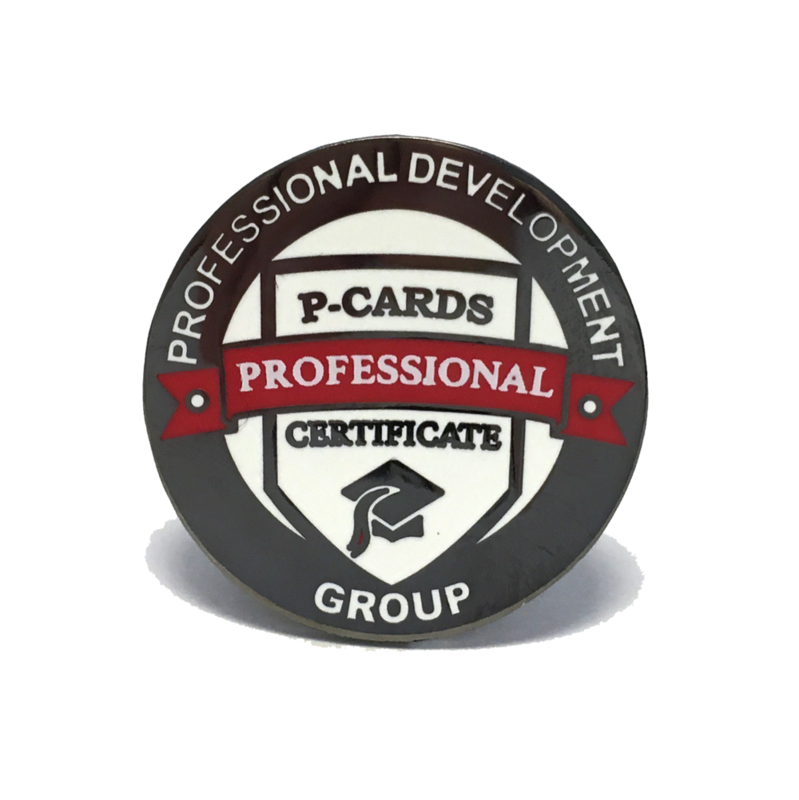 The P-Cards Professional Certificate (PPC) program is an online Learning Management System that once complete indicates a mastery in the Higher Education Accounts Payable and Purchasing Card Profession. The program is recommended for current Procurement/Buyer Card Staff, Accountability and Control Staff, Purchasing staff, Financial Analyst, Business and Finance Administrators, Account Executives and Auditors and Compliance Auditors. Professional Development Group (PDG) has teamed up Marty Newman for the instructional design of the program. Marty Newman is retired Assistant Director of Delegated Procurement at the University of Maryland. Prior to retirement her responsibilities included managing the purchasing card, small order, and master contract programs; reviewing University units that have delegated purchasing authority; and providing procurement training to campus. Annual expenditures under Marty's management exceeded $120 million. Marty taught the following courses to UM staff: Procurement 101, Procurement Using Sponsored Program Funds, and Purchasing Card. A Users Guide, or manual, is a tool that provides cardholders and other stakeholders with instructions and guidance. Let’s discuss the required components of a P-Card Users Guide, how the guide interacts with other elements of a successful P-Card program, and how auditors use the guide to assess the program. Samples will be available. In this session you will learn aobut everything you need to write an effective RFP including Rebates, Controls, Reports, System Requirements, Relationship Manager, Customer Service and Contract Terms. Are your P-Card program documents tired and outdated? Looking to totally revamp or improve on your existing forms? Then come join us in this informative session to learn tips and techniques for creating essential program forms. In this session we will cover everything from layout to content as well as everything in between. In this session Marty goes over the process of uniquely incorporating the right policies that fit the needs of your P-Card Program. Andrew Henley from Georgetown University presents a discussion on safety programs when handling P-Cards and ways to combat fraud, misuse, and other difficult scenarios. You’ve required training for your cardholders, you’ve made them sign a cardholder agreement. . . yet they still do things they’re not supposed to do. This session will explore best practices in dealing with personal purchases, restricted items, and cardholder fraud. The Payment Card Industry (PCI) Data Security Standard (DSS) and supporting documents represent a common set of industry tools and measurements to help ensure the safe handling of sensitive information. DSS is an industrial self-imposed security standard promulgated by the five major credit card brands (Visa, MasterCard, Discover, American Express, and Japan Credit Bureau -JCB). Common PCI audit findings include the following; Lack of overarching policies/processes; inadequate oversight; PCI standards conflict with institutional record retention policy and Sharing of merchant/purchasing accounts within the institution, among others. This session will emphasize auditing tips that can be implemented by your institution to be successfully prepared for a PCI compliance audit. Purchasing card programs are often the subject of audits. We get audited by system auditors, legislative auditors, federal auditors and private auditors. Heck; we even audit ourselves. Most common are the audits to ensure compliance with our established policies and procedures (are we doing things, right?). Then there are the audits to ensure establishment of proper internal controls (are we doing the right things?). We will address all of the above in this informative and interactive session, so come prepared for a lively discussion. We hear it all the time Compliance, Compliance, Compliance. Shutting down/closing Cards is part of our responsibilities, but what are the impacts? In this session we will take a look at the kinds of impact this has. What type of steps can be taken to reduce the need for cancellations? How the program is perceived by campus when cancellations occur? What can you do to work with the departments to ensure that the Program stays robust, while still staying compliant? This session will explore purchases, which can be problematic due to institution policies, IRS regulations, and/or preventing/detecting cardholder misuse. Topics to be discussed include food purchases, gift cards, PayPal purchases, foreign vendors and the tax implications, Internet vendors, and travel. During the session, the group will explore each category to learn exactly what makes them problematic. Session topics will also include implementing effective internal to mitigate the instances of non-compliance and prevent the abuse of institutional assets. Controls include procedures for documenting business meals and activities in accordance with IRS regulations, monitoring PayPal and Internet vendor activity, restrictions on travel purchases, and strict policies against gift cards and foreign vendors. Oh, the Places You'll Go with Travel and the P-Card! Come discover the process we went through to implement travel on our P-Cards and how we set up our program as a one-card solution. We will also show how we configured our groups using merchant category codes and how cardholders are placed in correct groups based on approvals and allowances. Collaborating with the Travel Department is a must, so we’ll give some pointers on that and auditing. Colleagues, you’ll move mountains! The role of the P-Card administrators and managers can sometimes be daunting as you manage the program. Some of our responsibilities include: Develop training (good cop), enforce policy (bad cop), audit card activity (forensic analyst), and analyze reports on spending trends (financial analyst). In the following session, we will talk about best practices that will help you manage your program. Iowa State University answered the call from its student leadership to develop an internet based Purchasing Card System for student organizations. Finding creative ways to customize an existing University Purchasing Card System is meeting student expectations and giving students more purchasing power to run their organizations, while also reducing paper and improving compliance and controls. What is data analytics anyways? Why is it important to analyze your program data? Data analytics reports are used to allow organizations make better business decisions or determine whether the systems in place allow an organization to operate effectively and efficiently. The objective of this session is to focus on: a) Spend analysis - Developing KPIs to monitor your program; and tips on using analytics to help with auditing and mitigating risk. b) P2P Strategy. Using the data to help with the decision making process of expanding your procure-to-pay strategy (i.e. 3rd party software, e-procurement tools, e-payables, etc.)! This is a general information session for P-Card topics you always wanted to know about but either were too shy to ask or just never had the time to research. The first half of the session will be a PowerPoint presentation of several different topics. The second half will be an interactive session for open discussion. A great learning and networking opportunity. At the University of Virginia, we have increased our P-card spend by 81%. We increased from $14.4 million to $26 million in the last four years. This is in addition to our payables ghost card program that had almost $40 million in spend for Fiscal Year 2013. I’ll talk to you about how we got there. Managing the change from your current provider to the new provider. Gap analysis between current processes to new processes (if any). Managing your partnership – setting expectations upfront. Understanding your issuer’s approach to helping you maximize your program. What are their experiences? How does your overall goal align with the strategies of the issuer and associations? University of Vermont business case – lessons learned.